Offering up to 335 horsepower with the capacity to accelerate from zero to 60 mph in just over four seconds makes the 2 Series a spirited ride when it gets out on the open road. Sports steering options give drivers targeted control for exactly the response from the vehicle they require. Choose from the coupe or convertible styles with plenty of customizable options to get exactly what you want from the 2 Series. 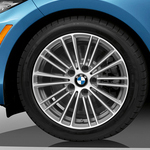 Experience BMW quality firsthand when you test drive a 2 Series vehicle. Visit us at BMW of Chattanooga and we'll arrange for you to take one out on the road and answer any questions you may have about the 2 Series and its many features.